Most women, at least in the Western world, will choose to go to hospital to give birth. This has become part of our mainstream birth culture. 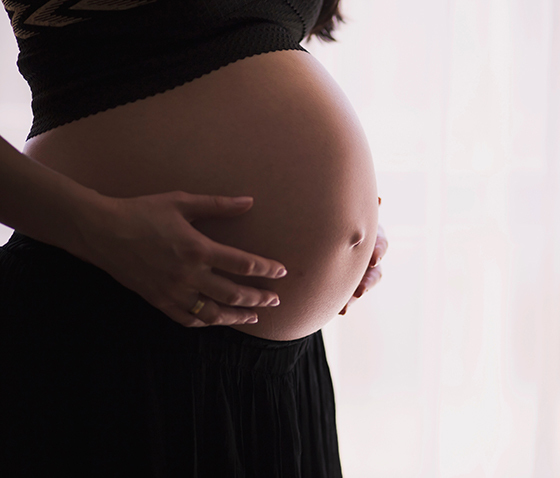 What women often don’t appreciate is that in fact they are going to an unfamiliar place to give birth, and they are likely to do so among total strangers. Birth itself is a very private act, just as making love is a private act. A woman needs to feel safe, secure and supported to open up. Shining a spotlight on her and constantly observing her are not the way to encourage her to do so. Looked at from this perspective, it’s clear that a hospital birth can present quite a few challenges. For a start, the woman giving birth, and the professionals surrounding her – the midwives and doctors – are approaching the big event from completely different directions. For the practitioners, the hospital is their familiar everyday working environment, one they feel perfectly comfortable in. Between them, they will have assisted at thousands of births – it’s nothing new. But this birth will be one of the most momentous events of your life, and you will be in a strange place, yet one in which you will be expected to let go and open up in the most intimate way. How easy this will be for you depends a great deal on your cultural background. 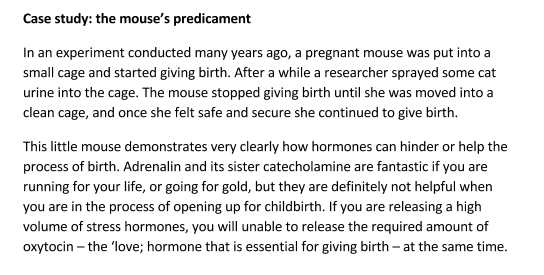 The following curious piece of research confirms just how important it is to feel safe and secure during the birth – and how hormones contribute to producing the ideal mood for labour. Your limbic system is the key to making yourself feel at home, no matter what the circumstances. It is only fairly recently that the limbic system has been recognised for the complex system that it is, connecting our memories, our emotions and our sexuality. Understanding this gives you the opportunity to use sensory stimuli of all sorts — a favourite photo, a much-loved piece of music — to bring up positive memories and combat the feeling of being in a strange place. 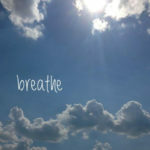 Music: put together a playlist for your breathing and relaxation exercises, as well as your favourite tracks, and bring something to play it on. Hospitals have their own distinctive smell: you can block it out and boost your limbic system by putting a few drops of aroma oil on a tissue or burning it in a burner (if allowed). Oils or sprays work equally well, but make sure you use a natural aroma oil: rose, jasmine, ylang ylang – or whatever your nose likes best. Some women like to bring in their own pillow or a shawl. Imagine you are going away for the weekend and you want to make your hotel room a bit more home-like. Which photo or picture (it could even be a postcard) would you put up? Choose something that will keep you going and remind you of why you are here today. Scratchy hospital gowns that leave you exposed at the back are not comfortable at all, so bring with you some clothes that you feel good in. Your favourite top: it should be something you feel really comfortable in and that you have already been wearing for a while, as it will be a connection with home. A vest: for if you don’t want to be naked in the bath. If you don’t mind being naked in the bath, don’t bother. Several items of your pregnancy underwear. Socks: sometimes when we’re nervous our feet get cold, so you want to make sure that they are nice and warm, even though your body is going to heat up during the birth. Comfortable tops/tunics to wear after the birth; they should open easily at the front for breastfeeding. It’s a good idea to go for something long enough for you to feel confident walking around in, but bear in mind that you will need to change pads (both breast pads and sanitary pads) frequently. You will feel so much more confident and in control if you have everything you are likely to need to hand. A plastic bottle or a plastic cup with a straw: you need to drink while in labour, but you don’t want to have to worry about glass breaking. If you are having a water birth, ask if they supply neck pillows, and if not, bring a small inflatable one of your own. Your camera and a charger or spare battery. It’s amazing to have some pictures from immediately after the birth (or even during the birth), to bring back this special moment. A ‘Do Not Disturb’ sign, to encourage staff to leave you alone, as far as possible, before the final stage of labour, so that you can focus calmly and positively on the amazing process you are involved in. Remember, just a little preparation can make a big contribution to a great birth.